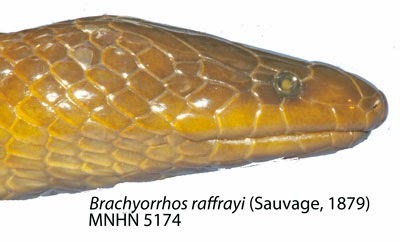 Atractocephalus raffrayi Sauvage, 1879: 62. Holotype: MNHN 5174. 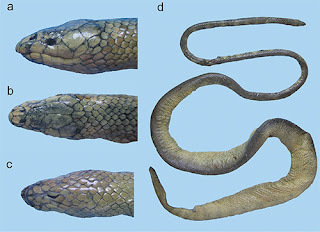 Type locality: Ternate, Indonesia. Brachyorrhos albusvar conjunctus Fischer, 1879 (1880): 879. Brachyorrhos albus– Boulenger, 1893, 1: 305. Distribution: Ternate, Indonesia (Murphy et al. 2012a). Diagnosis: A fangless homalopsid. Six upper labials, the third, rarely 3+4, enter the orbit, tallest upper labial is third; very pointed snout. A preocular is present in about 35% of the specimens examined, making it possible to confuse this species with B. albus.